Our Shea Butter Melt & Pour Soap Base is a detergent free soap base that is opaque and white in color. It contains Shea butter, which is thought to benefit dry skin. The twenty-four pound big block is ideal for larger projects, as it will make (96) 4 oz. bars of soap. Soap comes in a blue bag with twist tie and corrugate box. A single block measures 13 x 11.5 x 6 inches. COMMENTS: Handles well, doesn't sweat, lathers beautifully. The big blocks are a bit of a challenge to cut. COMMENTS: Used this to make my 1st 15 loaves of soap. Love it’s creamy and moisturizing capability as well as it’s a pure white. It’s so easy to color and get TRUE colors with the base being so PURE! COMMENTS: This is a quality product. I have customers tell me that they even love it as a shampoo bar! COMMENTS: I love how easy this is to work with. It cuts easy, melts perfectly, and never gives me any trouble releasing from the mold. COMMENTS: I absolutely love working with this soap. It is a lovely melt and pour soap, it takes colors really well, and cents at her added to it do spectacular. It cuts easily and melts quickly in the microwave. It is very moisturizers and does not leave your skin with a dry filmy feeling but rather soft and moist tries to. COMMENTS: Shea butter soap base is very moisturizing. I have made a few great soaps so far and really liked the way they turned out. It foams up very well. It can be a little soft so I have to be careful not to damage finished product. I have added a small amount of glycerin soap to help with firming it up. Otherwise this is a quality product at a very fair price and I will order it again when I run out. • A little soft/delicate to work with. COMMENTS: nice soap to work with, customers love that it is detergent free! A staple! COMMENTS: We have tried other products like this but have found that this is the best one. COMMENTS: I have tried many bases, but my customers like this one the best! Very easy to cut into smaller pieces using a sharp knife, accepts color and fragrance very well. Will continue to order and use! COMMENTS: Customers love this base. So many recipes it can be substituted for! COMMENTS: Great soap base for all projects! COMMENTS: The best part of buying in bulk is not having to re-order as often as you would in smaller blocks or trays. I know that is obvious but, when I started soaping, I had no idea how often I would be making new soaps. Buying this size, has helped me keep product on hand. I have done two of the 24 lb blocks now, and adding another. I hope that this will eventually be in re-purchase rotations so I don't have to order all 3 at once. Love the WSP soap bases! The only bad thing is, they do arrive in one big chunk, so in is easiest to go ahead and slice it all down into usable sizes when it comes in. I wish they would offering this size but maybe in large bags of chunks instead of one huge block or just slice it into pre-cut huge bars to make this chore a bit more manageable. But I rather have the savings and do a bit more work, if we can't have both :D.
COMMENTS: I really liked this product, it is pure white and very smooth. COMMENTS: This is my go to base for a white or pastel soap. Nice lather. Easy to work with. Sweats way less then other M&P bases. "24 lb. Detergent free soap block MP"
COMMENTS: Love this product! Perfect for customers that want detergent free productse. COMMENTS: This is an amazing melt and pour. I use it for my soaps. My customers always come back for more. "Detergent Free Shea Butter Soap Base - 24 lb block"
COMMENTS: Wonderful product! So easy to use. Large butcher type knife made quick work of slicing and dicing into easily melted pieces. Soap melted smoothly with lovely smell and texture. Pouring was a dream, it set fast and smooth. Made beautiful soaps that customers loved. Accepted additives, fragrances and colors very well. So far, I think this may be our fave of the MP we've ordered and used so far but ALL of WSP's MP soaps are stars at our craft shows and for our own use. This has been used as a shampoo/shave soap as well and we were pleased with it's performance and texture of hair after shampooing. Thanks WSP for another great product. Will order again often. "Best MP I have ever bought!" COMMENTS: You can't go wrong with the detergent free bases and this one is no exception. My customers just loved the feel of this soap when they used it. Crafter's Choice detergent free bases are the only ones I use. COMMENTS: Love this base, makes great soaps my customers love. "Detergent Free Shea Butter Soap Base"
COMMENTS: Excellent lather. I also like to blend with other bases (such as Coconut Milk) and the results are wonderful! One of my favorite bases! COMMENTS: I sell only goat's milk soap and shea butter soap at this time. I always buy the large block and use a cheese cutter to make smaller chunks. Love the smooth texture of this soap. Great purchase and will continue to buy again and again. "best melt and pour soap ever"
"Easy to use and Great Quality!" COMMENTS: We are new to making our own soaps, and have tried other melt and pour soap brands from another website, but this soap from Crafters Choice was like night and day compared to the other brands. It has a great feeling and lathers very nicely. It melts very quick in the microwave and we haven't had any issues. Other brands would feel okay then putting them through a microwave would destroy the texture making the soap hard, with this brand it saved us time and money because we can just heat up a small batch, and pour it. "Shea butter at a great price"
COMMENTS: The base is a nice bright white color that accepts color and provides a beautiful pastel bar of soap. The soap is a great way to provide Shea butter at a very reasonable price. This soap works great for individual cavity molds as well as loaves. We will continue to purchase this product. COMMENTS: Was great to use. But hard to cut when it first arrived but the next day and afterwards was really easy to cut. COMMENTS: This is my favorite base to work with! Moisturizing to skin with great lather. COMMENTS: This is the third shea butter melt and pour soap that I have tried. It is by far the best that I have seen and tried. It melt about 30% quicker than others and it comes out very smooth. The other two that I have tried leave a skin on the top that takes a while to melt down even when I am constantly stirring. Not only is it so much better to melt but it is a fantastic soap base that I will continuously use. COMMENTS: Takes on extra ingredients well, nice neutral white color (I was expecting yellow) for coloring yourself. 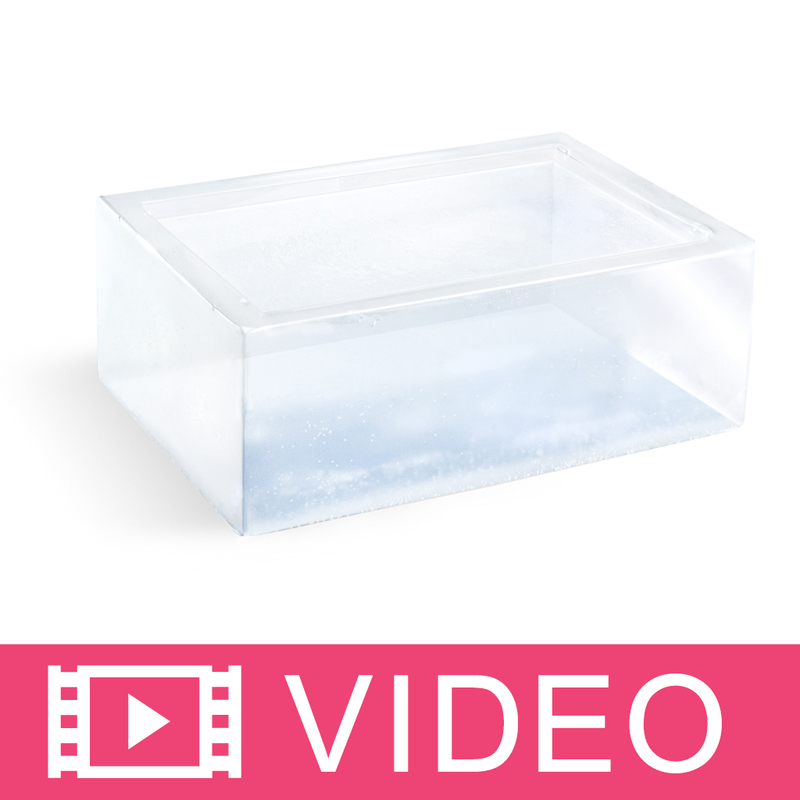 COMMENTS: I use this base to make my best-selling soaps - it's easy to use and very high quality. COMMENTS: I LOVE this base because it not only cut and melted like butter but it leaves your skin soft as silk. And it retains fragrancea exceptionally well. Definitely gonna stick with it! COMMENTS: Love the creamy lather that this soap makes and the way it makes my skin feel after a bath. "Detergent Free Shea Butter Soap - 24 lb Block"
COMMENTS: I make train soaps for a local hotel. The guests just go nuts over these soaps. And the description is correct, unwrapped soap will cure and shrink a bit overtime. COMMENTS: Detergent Free Shea Butter Soap is great in my MP soap products. "Shea Butter Soap-24 lb. Block"
COMMENTS: This is another great melt and pour if you are in a hurry and cannot or do not make hot or cold process soap. The shea really delivers a wonderful lather and leaves the skin so soft. I use this one for my baby soaps. Everyone loves this. • Gives a wonderful later. • Leaves skin so soft. COMMENTS: This huge block of soap base was so much fun to cut up and use! I had a weekend of nothing but carving out hunks of soap base and watching other soaps coming out of it- I ran out of soap base before I ran out of ideas, so I will be ordering more...I am a beginner, but have already begun selling my soaps and they seem to be well-liked...looking forward to my next shipment! COMMENTS: I have a lot of customers that ask for Shea butter and I love the fact that you offer big blocks at much better pricing than getting the 2lb trays. The only thing I would change is somehow making it easier to cut up. COMMENTS: This is simply the best Shea Butter Soap that we have found. Easy to work with and very for giving. We give this a thumbs up. COMMENTS: Great soap straight out of the package. No ingredients needed for a perfect facial or body soap. COMMENTS: Good to make nice sugar scrub cubes quickly. COMMENTS: This is the best soap base I have used so far. I tried it because my usual base was not available. I will order this from now on. It has a creamy texture and my customers love the fact that it is detergent free. You can not tell the difference between the detergent free and the regular soap base but my customer's prefer it! "Very gentle of on skin"
COMMENTS: This melt and pour soap is a solid performer. It is low sweat and melts evenly. Very gentle on the skin. I wish the 24-lb block wasn't so unwieldy to cut. Yet, it's price is preferable to the price of the 2-lb tray version. Perhaps consider selling it as a 24-lb package with four smaller 6-lb parcels within the box. COMMENTS: This is an excellent soap base. My melt and pour soap lathers very well. COMMENTS: Great soap - nice lather, Sets nice , love it! COMMENTS: I can't put in to words how beautiful this soap is. It was sticky to the touch and knife when cutting sort of, it had a bit of a feel to it. It was so creamy and lathery, when I am done washing my hands they feel really nice. I love shea butter but hadn't had it in a soap before, I just totally fell for it! I would buy it again! COMMENTS: This soap is fantastic! Melts very nice and smooth, pours wonderfully. There is little lather and it's rich and soft. My customers rave about this! COMMENTS: It is very good product. Will order again. COMMENTS: So far so good! No problems with this base! Cutting a 24lb block has been a little challenging, but the price break is worth it! COMMENTS: I go through soap alot with my customers, and wanted to try this one ( well to tell the truth ) It just wasnt as good as the others, sure it sweated , and to me it was alot ( at least the clean up is a Breeze ) it didnt seem to get hard as fast as the others, twice as long to get hard , If your in a hurry and need to get a order out fast. I feel this isnt a good choice , it sweats way to much ( I really dont want to sell sticky soap ) ( I even took it out side for the wind 2 hit it) ( It did the trick) but if your in a hurry and have a time frame ( I wont get this Bar again ) Thought i would pass it on ( hope this helps ) siren wrap works well , but u cant be in a hurry with it ...:O( Thankyou ! COMMENTS: This is by far my favorite MP soap base. It melts down so easily and takes pigments and scents very well. It's so moisturizing and the options are endless when it comes to recipes. I will be buying A LOT of this through the holidays for my customers! Thanks for a great product! COMMENTS: This is the best shea butter based soap around. Great for customers who prefer a detergent free glycerin soap with the benefits of shea butter that it contains. Lathers well even in hard water. Customers state that it leaves skin feeling very soft. Have used most of the different soap color blocks in this soap. Colors work well. COMMENTS: This is my workhorse base. It sets up well, cures well, really is low sweat, and is creamy and luxurious. "I Have Found My Base!" COMMENTS: I have tried many bases and all I can say is ---- I Have Found My Base! I will be buying more and the block is so easy to cut!!! COMMENTS: the way i do my bar soap is to melt this and add some high butter content shea butter along with colorant,fragrange and at times oatmeal,honey or whatever i wish.i then put it in molds and let it set..take out of molds and presto!your soap is ready..so fun and makes wonderful gifts. The price is very competitive also. COMMENTS: base! Cannot go wrong using it. COMMENTS: This is my go-to soap base! No problems with sweating, except in 90+ degree and 90%+ humidity in the Deep South, unwrapped. Fantastic with the addition of a couple tbsp. of kaolin clay. Great lather. "wonderful creamy great for sensitive skin"
COMMENTS: I enjoyed the wonderful smell of shea butter. Everytime I used a bar a luscious creamy lather to help clean and soothe my skin. My mother who is very picky about soap just loves this soap. The quality of this soap is well worth the money. If you have sensitive skin this is the best you could use. COMMENTS: I started using this in place of my goat's milk soap to meet the needs of my area, where some people prefer animal free products. It's nice and hard and not sticky! COMMENTS: The best soap - nice lather, looks great, just love it!!! My customers just love it! COMMENTS: This is my new base for all my M&P. I love that it is detergent free. The block can be a little intimidating when you get it, but with a little practice, it is not too difficult to cut into. I live in the deep south and it can stay a little softer than detergent but I think it is a fair trade off. Highly recommend! COMMENTS: Great soap to use. Easy to to use to make your own fun soaps, with your own scents, and your own colors (use powder mixed with glycerin bases though). I am selling these as a fundraiser for a charity and all the ones I screw up on I use, my wife loves it, lol. COMMENTS: This soap base is amazing all on it's own. I don't add any colorants or fragrances. I simply melt it and pour it into WSP square silicone mold. GREAT STUFF!!! COMMENTS: I switched to this MP base and I love it. No sweat beads and I love the shea butter, it's creamy and produces bubbles. COMMENTS: Winner, winner, winner. I've had this in my line since WSP introduced this shea butter soap base. My customers love, I love it. Rich lather, a breeze to work with an great for sensitive dry skin. Thanks WSP !!! COMMENTS: This soap has a nice lather and can be used in many products. "Can you melt down just the amount you need. I came across a video you made on goats Milk body wash and the video showed a gallon of licquid but you sell in a sold bar to melt down? I’m a little confused. Thank you"
Staff Answer These are two different products you are referring to. The video for the Goats Milk Body Wash uses the Liquid Suspension Soap Base: http://www.wholesalesuppliesplus.com/products/liquid-suspension-soap-base.aspx. The DF Shea Butter Soap is a Melt and Pour Base. It is solid soap which you can melt down, add fragrance and color and pour into a mold. Here is a video you can watch: http://www.wholesalesuppliesplus.com/handmade101/watch-to-learn-videos/how-to-make-melt-and-pour-soap.aspx. "Have you thought about making MP soaps without Propylene glycol or using an alternative to it? People expect to buy soaps that are as natural as can be. I checked with one other soap supplier and they said they are working on an alternative to propylene glycol." Staff Answer At this time, we have no plans to change our formula for melt and pour soap. "Is this soap base vegan? Also gluten free? " Staff Answer We recommend checking the ingredients to decide if you consider this base vegan. We cannot be sure if it is gluten free as many other products are manufactured in this same space. "Where are the ingredients "
Staff Answer Sodium Cocoate, Propylene Glycol , Sodium Stearate, Glycerin, Water, Sorbitol, Butyrospermum Parkii (Shea) Seed Butter, Titanium Dioxide. All ingredients are listed under the 'Ingredients & Directions' tab of our bases.